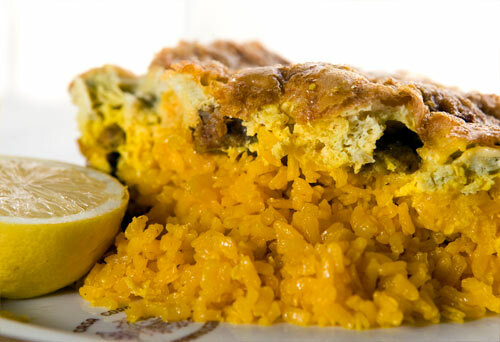 This rice casserole is one of the signature dishes of Murcia, a region that excels in rice cookery. If you cannot find butifarra blanca, a white pork sausage of the region, bratswurt or a similar white sausage can be a substitute or you can simply omit the sausage. Ask your butcher to chop the spareribs coarsely; and be prepared to use your fingers no nibble on the rib bones. In a large (about 15-inch) cazuela, heat the olive oil over medium-high heat. Add the spareribs, sausages, if using, pork, and chicken and fry, turning as needed, for about 10 minutes, or until lightly golden on all sides. Add the salt and tomatoes and mix well. Meanwhile, in a saucepan, bring the stock to a boil. Decrease the heat to maintain a simmer. Add the pimentón to the cazuela and stir quickly to combine with the meat-tomato mixture. Add the stock, increase the heat to high, and bring the stock to a boil. Add the rice and stir with a wooden spoon until well mixed with the rest of the ingrediens and evenly distributed in the cazuela. Decrease the heat to medium-low and cook, without stirring, for 2 minutes. Place the cazuela in the oven and bake for 10 minutes, or until most of the stock is absorbed and the rice is nearly tender. Pour the eggs evenly over the surface of the rice and bake for about 5 minutes longer, or until the eggs form a crust on the surface. Serve immediately.